Creating new MS Office documents from scratch can be quite a time consuming process. Entering recurring data in a worksheet can be especially monotonous. 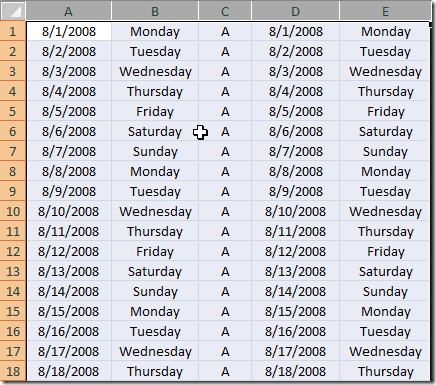 By using Autofill in Excel we can speed up the process of entering in days of the week, dates, times, etc. For example we can use Autofill to enter in the days of the week. 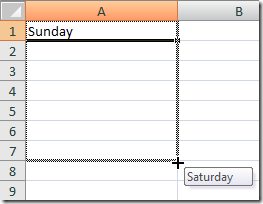 Simply start by entering Sunday in a cell left click and drag down or across the cells you want to populate and release. Following that basic guideline we can make a quick schedule. Here I am making a simple delivery schedule. I want it to be for the next two weeks. 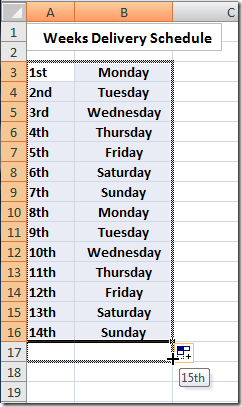 Using the method above I create two weeks worth of weekdays and am also associating the date of the month as well. I start with one cell showing the 1st and the next cell showing Monday. You will also notice you can select the Icon that appears at the edge of the last cell for a drop down menu that includes additional options. Using the Autofill option really can save a lot of time when you are entering in redundant sequential data. Even a mm/dd/yyyy format can be easily created. 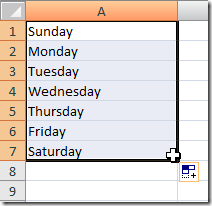 Again Autofill can be used going horizontal or vertical in the sheet. Here is a quick example of a weekly chart. Hopefully this will help you out and once you get the hang of using this feature, creating worksheets from scratch or even using this to analyze data can be much easier.